Michael Lowenthal published “The Same Embrace,” a novel about twin brothers, 17 years ago. Since then, he’s won raves for smart, unsettling books with complicated characters and deep emotional resonance, including “Charity Girl” and “Avoidance.” His last novel, “The Paternity Test,” came out in 2012. Right now, while he searches for his next book idea, he’s working on both essays and short stories. He lives in Roslindale with his longtime boyfriend, the novelist Scott Heim. NIGHT AND DAY: I almost always work from home. Me and Scott — he works from home as well — were looking for a place and found one that technically is four bedrooms, although two are just tiny little offices. Even though we have a little bit of drywall between us, we send e-mails back and forth. We have very different schedules: I’m on my own for four or five hours in the morning to work while he’s still asleep. He stays up late working, when he has the run of the house. FREAKISH CONCENTRATION: When I’m trying to work, I try to block out almost everything. That’s why I have my desk facing the wall instead of a window, so that I can see as little as possible. Sometimes, I actually keep the curtains drawn so I can’t look out the window. I often put in earplugs and put on noise-canceling headphones over the top of the earplugs. I’m a little bit of a freak. 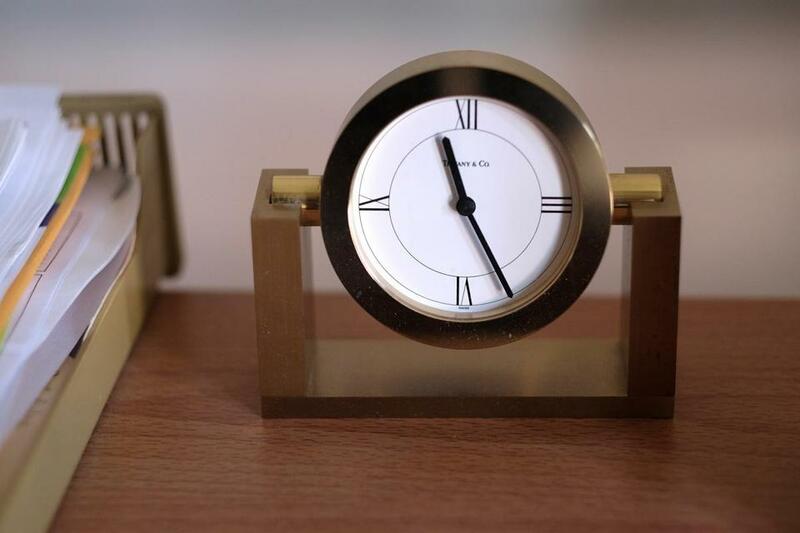 A Tiffany clock given to novelist Michael Lowenthal by his mother, perpetually shows 11:25 as Lowenthal doesn't like to be distracted by time while working in his home office. 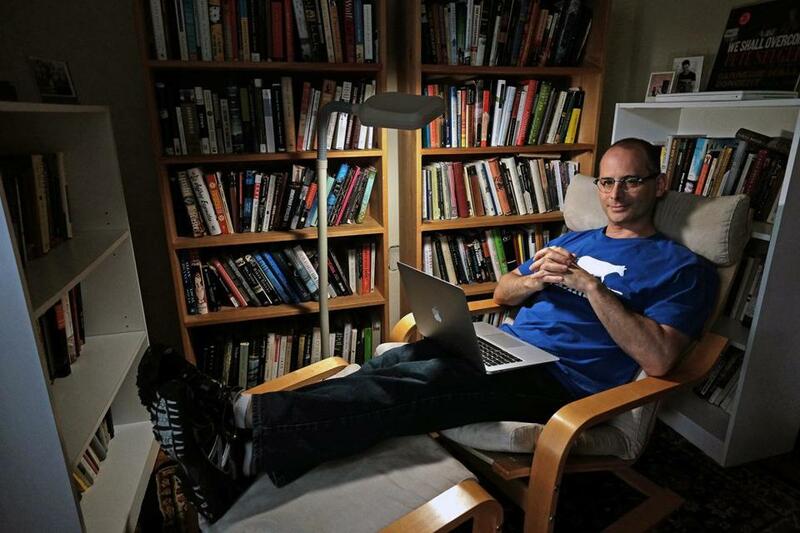 HAPPY MEDIUM: I’ve found that my happiest state is being in the middle [of writing a book]. My novels have all taken me about four years to write, so that’s a good long chunk of being in the middle. With short stories and essays, you have to start so often. Starting is really hard for me. 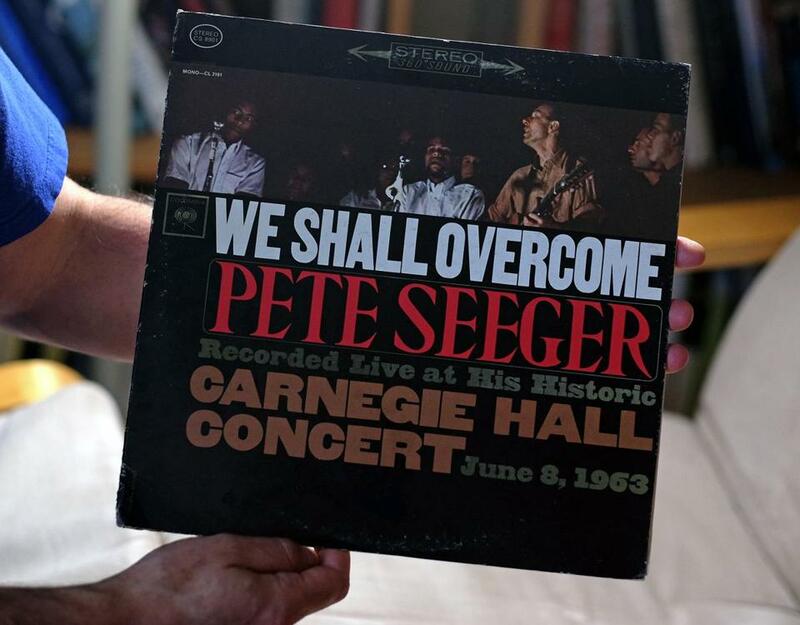 Michael Lowenthal holds a Peter Seeger album, his favorite growing up. When I was writing “Avoidance,” there’s a little scene where they were setting off fireworks for the 4th of July. I knew that different fireworks have different names and different ones do different things before they explode, but I didn’t know what they were. This is back before the intergoogles, so I actually got out ye olde phonebook, completely cold-called a guy, and asked him. He was so excited to tell me all about fireworks: how you light them off and what they’re called. He gave me these fantastically evocative names, and I just put them all right into the book. For “Fraternity Test,” I looked up a surrogacy agency and cold-called them. The receptionist answered the phone. I said, “Please forgive me. I’m a writer working on a project about surrogacy, and I’m wondering if you think there’d be anybody there who’d be willing to talk to me about what it’s like as a surrogate.” And the woman said, “Well, I did [it]. I’d be happy to talk to you.” So we chitchatted for a long time, and I was scribbling furiously, making notes, and a lot of what she said went straight into the book. That’s a great benefit of writing contemporary novels . . .
I’m so much more confident in my ability to be friendly, polite, and sociable than I’m confident in my ability to make things up out of thin air, so if there’s a choice between sitting at my desk and pounding my head against the wall trying to come up with something or cold-calling a stranger, the stranger seems like a great option. Eugenia Williamson can be reached at eugenia.williamson@gmail.com.